Jury duty is a mandatory obligation we all are faced with from time to time. We can’t plan ahead for this service. As an employer, it’s important to know your responsibilities when one of your employees notifies you that they have been summoned for jury duty. This is particularly important if you employ workers in multiple states, as the rules vary by state. This article provides an outline of the information you need to know. An employee who has been called for jury duty is either picked to serve on a jury or dismissed. If dismissed reasonably early in the day, an employer can expect the employee to come to work for the remainder of the day. On the other hand, the employee can be selected to serve on a jury that goes on for months, and may even be sequestered. An employer’s jury duty policy needs to take all these factors into consideration. Jury duty leave provides a paid or unpaid absence from work when an employee is required to report for jury duty. Jury duty availability is mandated by law. Thus, employers in every state are required by law to provide an employee with time off from work in order to perform their civic duty. If the summons to jury duty occurs at a time of the year when the employer would experience a significant impact from the loss of that employee, the employer may write a letter to the court. The court will consider the employer and employee’s request for postponed jury duty on a case by case basis. The Federal Fair Labor Standards Act (FLSA) does not require payment for time not worked, including during jury duty. 2 This type of benefit is generally a matter of agreement between an employer and an employee (or the employee’s representative). The matter of payment to the employee while serving on jury duty has been reserved for states to address. Massachusetts Yes, for regularly employed employees. Regular wages for the first three days. Tennessee Yes. Regular wages, minus compensation for jury service. You do not have to pay the employee if they are a temporary employee or have worked for you for less than six months. You also do not have to pay wages if you have less than five employees. Alabama, Arizona, Arkansas, Indiana, Louisiana, Mississippi, Missouri, Nebraska, Nevada, New Mexico, Ohio, Oklahoma, Utah, Vermont, and Virginia. Some states favor the employee and do not allow an employer to subtract any jury duty time from an employee’s paycheck. Requirements also vary based on whether an employee works for the state, Federal or local government, or for the private sector. Additionally, Federal law prohibits employers from taking adverse job actions such as employment termination against an employee who is required to report for jury duty. Adverse actions include harassment or threatening or trying to coerce the employee. An employee must be allowed to report back to work following his or her jury duty. We are compliant with all the state jury duty requirements. 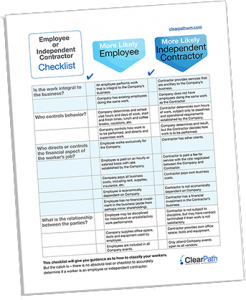 ClearPath can help you accomplish your day-to-day tasks pertaining to your workers. We can help relieve this burden by outsourcing your back office Human Resources and Payroll functions to our Employer of Record service. Contact us to learn more about how our expert personalized service can let you get back to focusing on your business goals. Work with a leader in the industry for outsourced Human Resources and Payroll functions associated with W-2 and 1099 contingent workers. Let ClearPath be the path to your peace of mind. This blog article is for general information purposes only and does not provide an in-depth overview of jury duty laws. It should not be solely relied upon or substituted for legal or professional advice. Employment categories and circumstances, along with detailed provisions of these laws, must be taken into consideration. Use of the information provided is at your own risk. Previous Post: « Is Your Organization on an Industry Hit List?